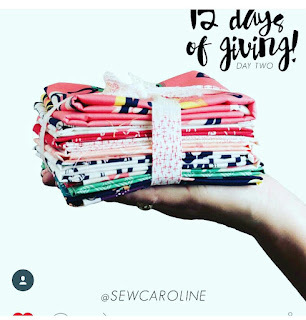 The giveaway was hosted by Sew Caroline and it was a bundle of Happy Home fat quarters. 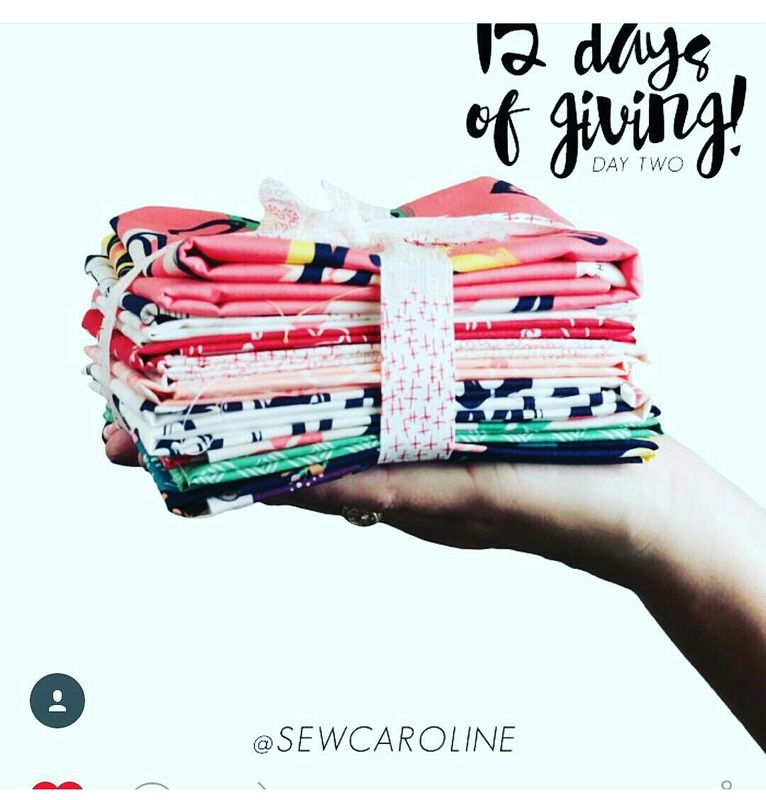 Honestly, I was so surprised I won this giveaway, there was so many comments but within a few days, the fat quarters were in my home. Yes, Lori, you really did win them. 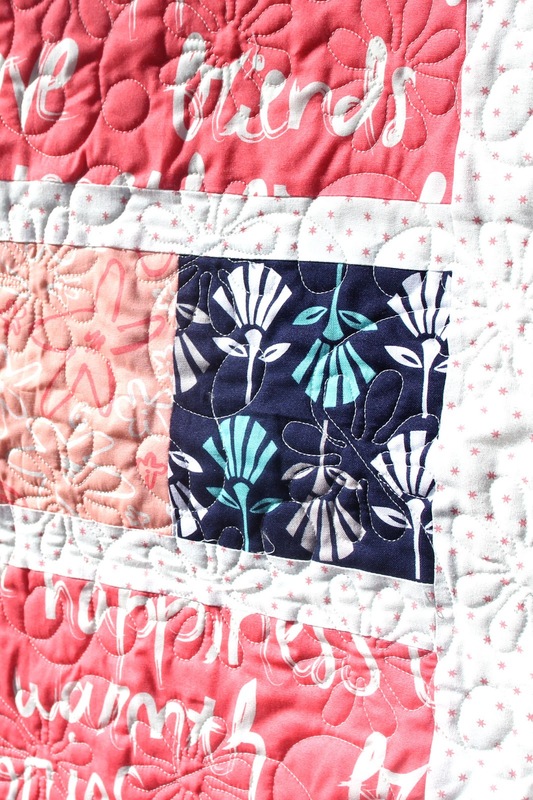 Now start planning some great quilts! These fabrics were perfect for baby girl quilts and I have two friends having little girls very soon. 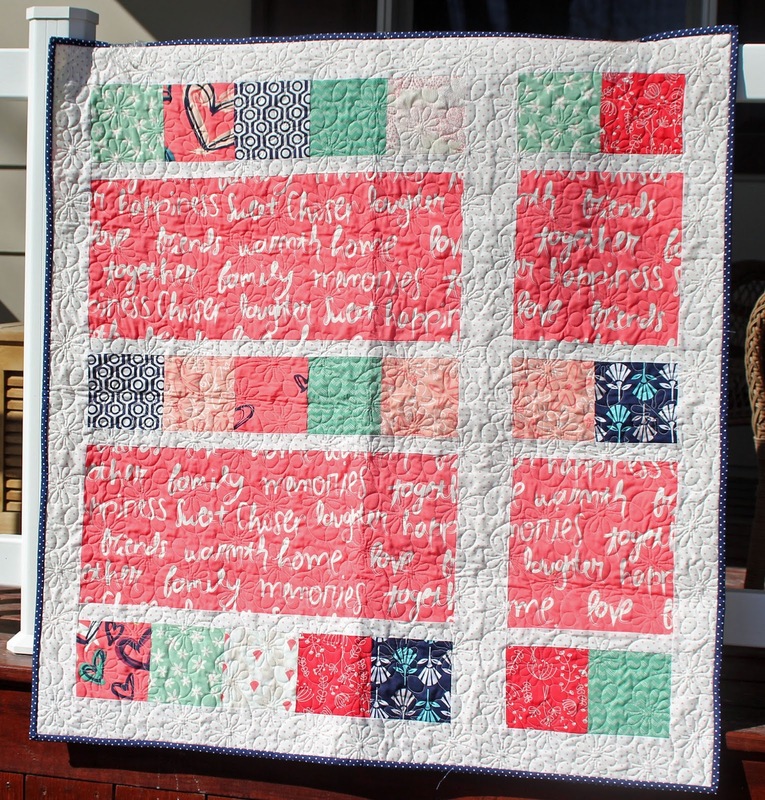 The week before Christmas, I have a hard time focusing on a garment project but I can do quilts. 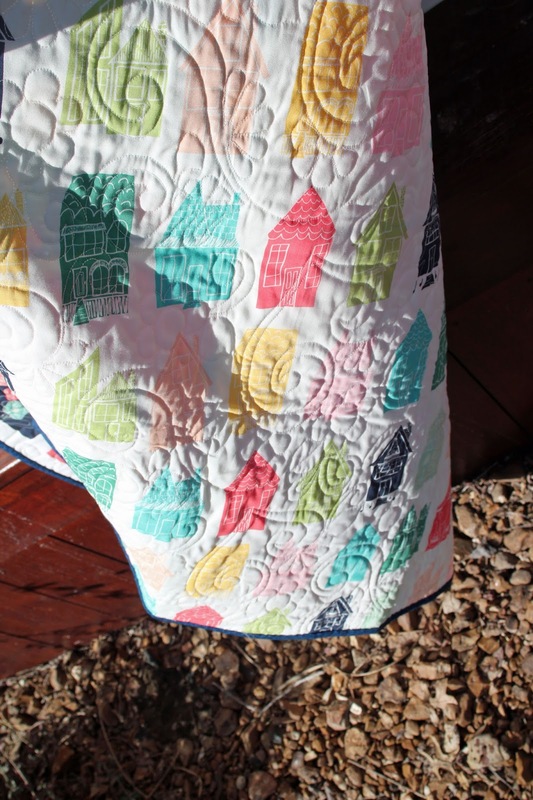 With the fat quarter bundle and some yardage in my stash I was able to make 3 baby quilts. 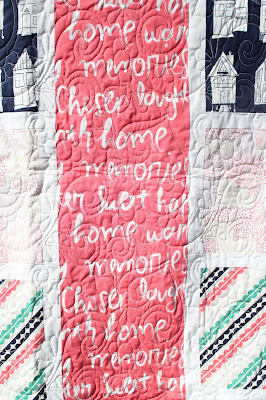 I did have a yard of the pink text in my fabric collection and knew it would be perfect for this pattern. 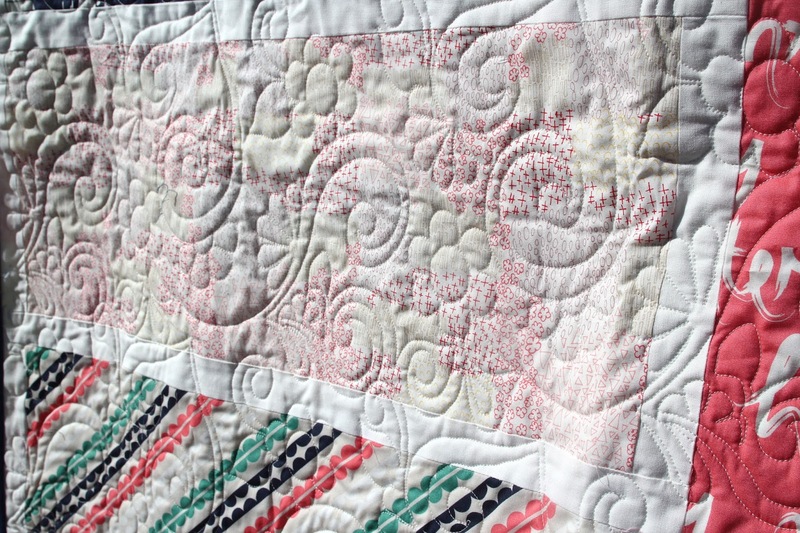 And I love to show-off the quilting, my long arm quilter does an amazing job. The back of all three quilts is leftover house fabric from my Irish Chain quilt and I used it all up. 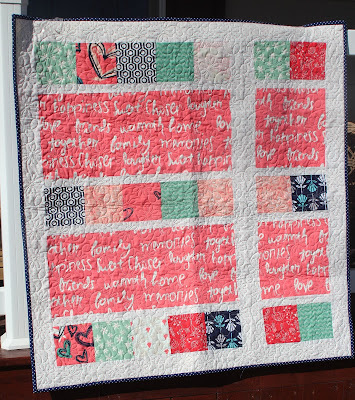 Quilt 2, is my own design based loosely on the first quilt. The squares are five inch blocks and as you can tell a few new fabrics were introduced to this quilt. 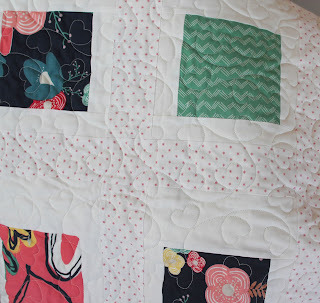 I find it a challenge to try use fabric from my scraps. 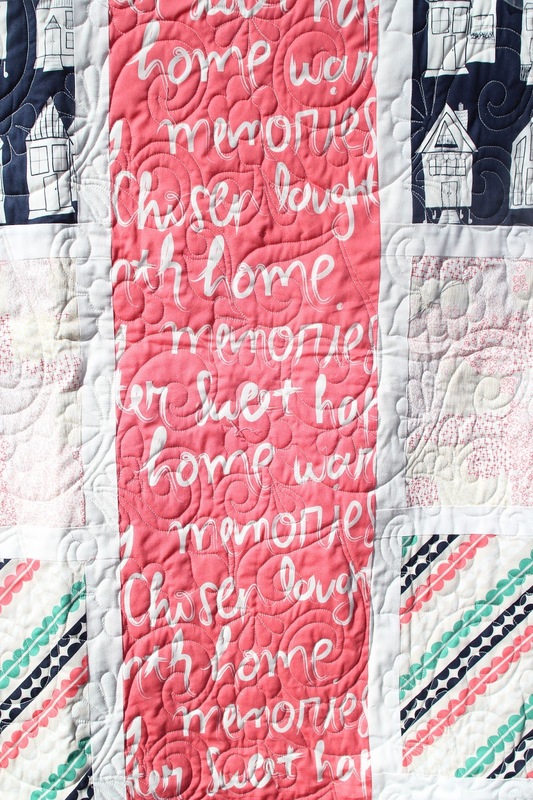 I love how this turned out and the text fabric is the one that really "speaks"
Quilt 3, last but not least. It is a pattern from a book, which is packed away. Oh, yes, we are about to start a remodel - kitchen mainly but I will have a new sewing room. This sewing roomwill not be in the basement, it will be a loft overlooking the kitchen and dining room. I am so excited, natural sunlight for me and my sewing. New cabinets, better lighting, more room to move around. The blocks are framed with Moda Snow and the rest of the background is cream with small stars. These stars don't show up from a distance but up close you can see them. 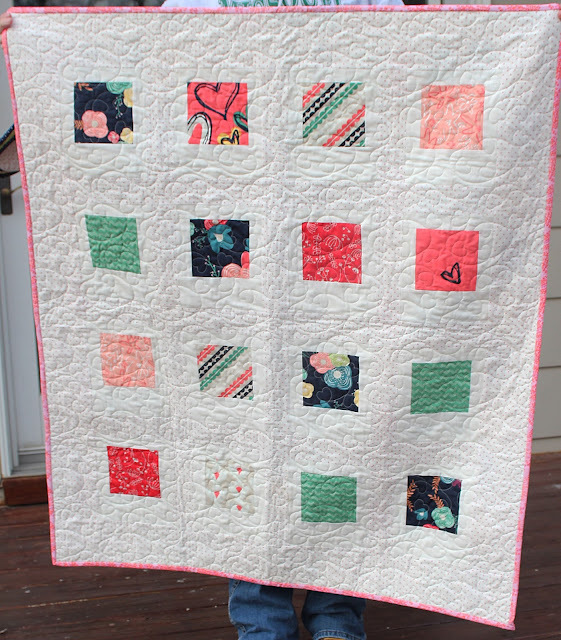 I feel like this cream and pink is just the right accent for the squares. 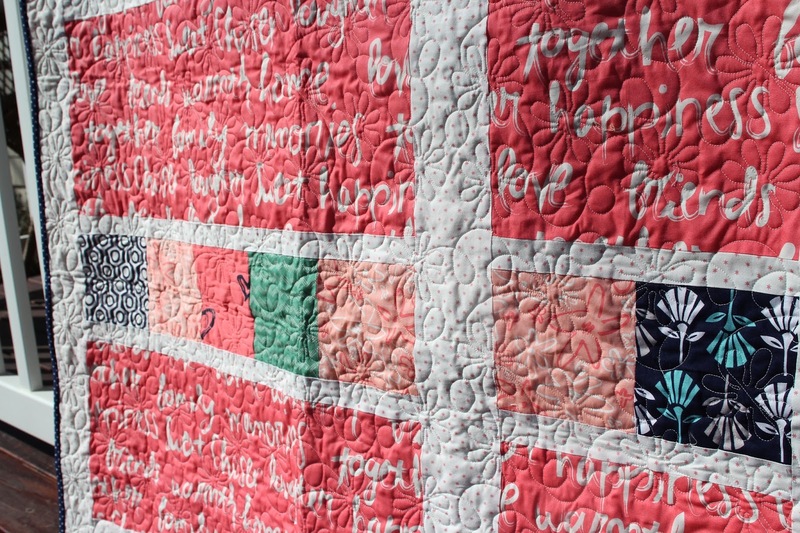 With all of the cream in the quilt, it was really hard to photograph. 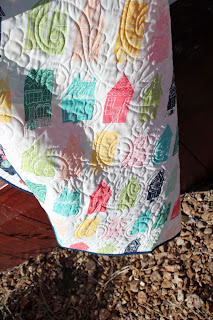 I want to thank Sew Caroline for an amazing giveaway, your fabrics are gorgeous and I loved using it to create special baby quilts. Love these. 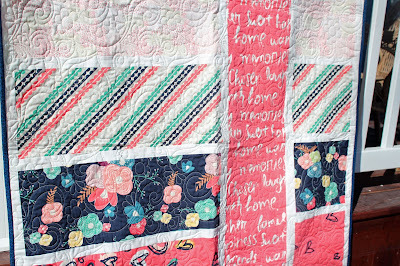 I just discovered your blog because of the beautiful quilts you make but am enjoying seeing all the garments too. 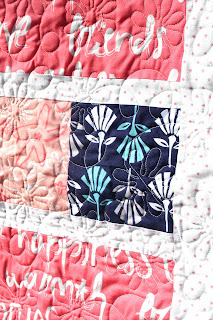 Beautiful quilts Lori. What a great gift for those babies. They will cherish them, for sure. You have some lucky friends. 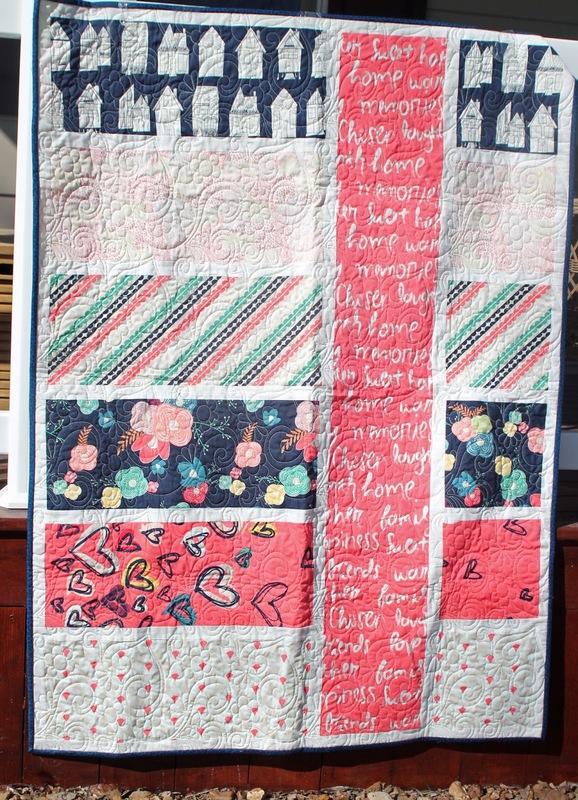 The way you used your giveaway resulted in beautiful quilts! Thanks, it sure was fun using that beautiful fabric. Beautiful, beautiful, beautiful!!! I love them all. Good luck with the remodeling. I can't wait to see your new gorgeous sewing space! 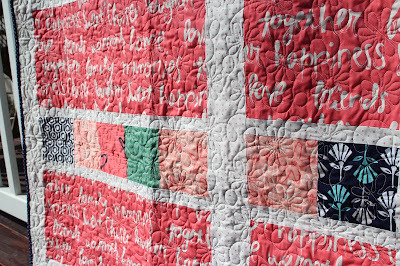 Thanks, Ann, I love these quilts. My remodel has been put off for 2 weeks, I hope that contractor gets to me soon. Wow three all at once. Impressive. I like #1 the best but they are all so pretty. New sewing room, how exciting. Have fun planning it. Wow beautiful as always! I really have to take a quilt class . . . Thanks, Joen, be warned you will be hooked! Incredible! 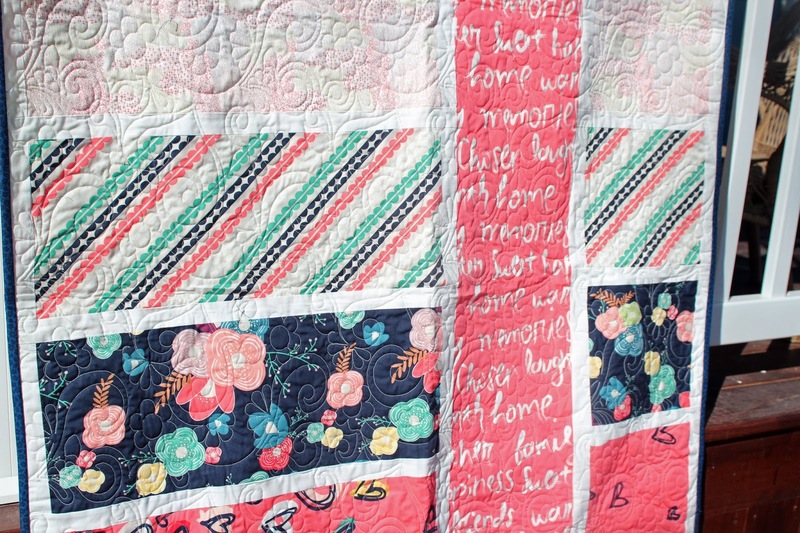 I was gifted some quilting jelly rolls for Christmas, and have my plan for them in regards to piecing, but how do you choose which quilting pattern to use? Can you point me to a resource or words of wisdom? Thanks, Linda. I would look at Pinterest or Moda Bake Shop for inspiration. These are all beautiful! 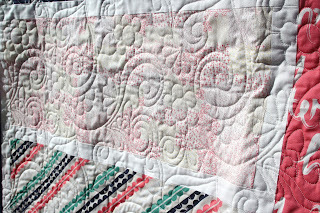 I love the subtle whites and creams on quilt 3. Love them all! Thanks, Diane, the white and creams do make the colors pop.